My brother Marc asked us to finally post this for him. So babe, here it is: Colombian Patacones for you! My husband and mom in law taught me how to make these amazing treats. You should have these like most carbs after your workouts, don’t forget. Peel and cut the plantains into 3/4 inch long slices. Douse Plantains with Coconut Oil and place into oven for about 10-15 minutes turning over as needed. 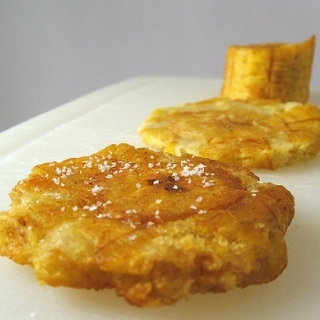 Remove Plantains from oven before completely cooked and use two cutting boards to smash them into a thinner “patacon”. These should now be about 1/4 the size you started with. Splash with some water, sprinkle sea salt, and brush with some more Coconut Oil. Place back into oven. Cook for another 10-15 minutes turning to make sure they are nicely browned on each side. These are so incredibly delicious and healthier then the Colombian twice fried traditional; you will love them. These are amazing with guacamole, cuban style dinner, or anything else that you love! I’m from Puerto Rico and here these are known as “tostones”. Traditionally they are double fried as in Colombia. I’ve never tried them baked, but they must be good. Just so you know, using plantains that are starting to ripen result in a delicious alternative with a hint of sweetness.